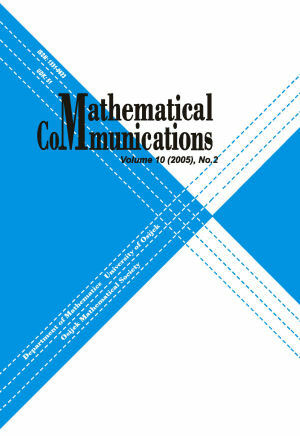 Mathematical Communications is published by the Department of Mathematics, J.J. Strossmayer University of Osijek in cooperation with the Osijek Mathematical Society. The journal was initiated in 1996. PLEASE NOTE that starting from 1 January 2013 editorial work related to Mathematical Communications will run using the Open Journal System (OJS – an electronic journal management and publishing system). Previous issues are available at the Hrcak database - Portal of scientific journals of Croatia. The next issue of Mathematical Communications will appear in June 2019.